It's the Rheo Thing: Polymer Single Crystals - "Spaghetti in a Box" or something else? Polymer Single Crystals - "Spaghetti in a Box" or something else? This simple picture completely changed our understanding of polymer crystallization. These are single crystals of polyethylene, carefully crystallized from dilute solutions in xylene. It had long been assumed that polymers crystallize as fully-extended chains - "spaghetti in a box". But there was no proof until Andrew Keller came along. X-ray diffraction showed that the polymer chains in these crystals were oriented perpendicular to the surface - they are coming out towards the viewer and and are not running along the viewing plane. But the bigger question here is how thick the crystals are. And that can be differed from the the size of the shadows on the photograph. In order to more clearly observe the crystals, they had been coated with a thin layer of metal coming from a source laterally offset from the crystals. Because of the geometric constraints, some portions of the samples were shadowed from the stream of metal atoms. The size of these shadows then allowed for a quick and easy calculation of what the crystals thicknesses were. .From this approach, it was then possible to determine the effect of temperature on fold length and a myriad of other aspects of polymer crystallization. All because someone paid attention to the details, those tiny little shadows in the image. [*] "Ramen in a bag"? I just came up with that. It's weird, but the more I think about it, the more I like it. 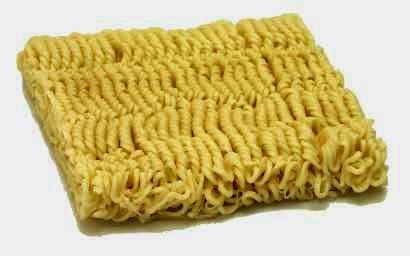 I would love to use the Ramen analogy in an upcoming presentation. May I? I can look up the ACS-approved method for citing blogs, if appropriate! Feel free. Let me know when and where so I can cite it too. Plastics to Oil - Hype or Hope?